Improved grip controls on the focusing ring, shutter speed ring and on the FLE ring on the 40mm and 50mm lenses. Visit here to see technical specifications and MTF graphs of the Sonnar CFi 5.6/250; if necessary, you can find simple explanations of the terms below here. The lens has an angle of view of 13 degrees, which often comes in handy when a mid–range telephoto lens is required. At the same time, it fits well with the other focal lengths available in the telephoto range of the Hasselblad V–series lens lineup. 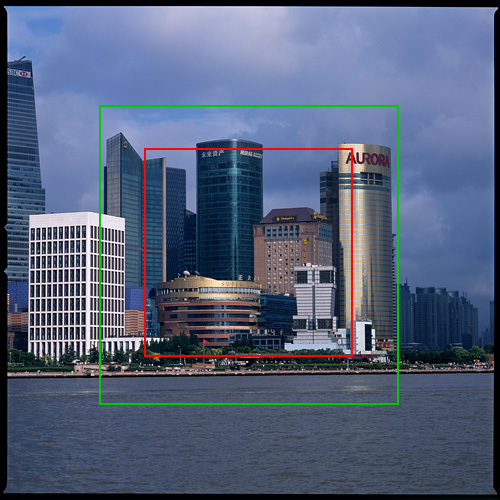 The image below was taken with a 150mm lens; the green rectangle indicates the field of view of a 250mm lens (the subject of this review), while the red rectangle corresponds to the field of view of a 350mm lens. The lens boasts a built–in leaf shutter, and apart from shake–free operation when mirror pre–release (mirror lockup) is used, it also means flash sync at all shutter speeds (up to and at 1/500 sec.). The shutter can be disabled when the lens is used on Hasselblad bodies that employ focal–plane shutters. The lens also has a unique and handy feature common to all Hasselblad CFE and CFi lenses: it boasts an EV (Exposure Value) scale and a locking button that allow one to easily change the combination of shutter speed and aperture while maintaining the same exposure value. Hasselblad V–series lenses define what the proper quality of lens construction should be. The CFi 5.6/250 is very solidly built and a pleasure to handle and use. Operation of the shutter speed and aperture ring, as well as that of the DOF preview knob located on the lens barrel, is smooth and substantial. Very importantly, operation of the focus ring is silky and precise (meticulous and accurate focusing of telephoto lenses is absolutely crucial to obtaining the best sharpness possible, and this is the main reason why I prefer this lens over its predecessor, the CF 5.6/250 lens, even though both lenses have the same optical design). At 1000g the lens is not exactly light, but nor is it heavy considering its focal length (and given the fact that the CFE 4/180 lens is slightly heavier). The lens is not exactly small, too, but it still fits vertically into my ThinkTank Airport Acceleration camera backpack when the backpack is lying on its back, and thus the optic is not too much of a burden for travel. Whereas it is possible to use the lens for hand–held photography, critical focusing and exact framing will more than likely be compromised, so the lens is much more at home on a tripod than handheld. Technically, there is vignetting; aesthetically, there is no vignetting. This is to say that unevenness of illumination that the lens exhibits is mild and gradual; you are unlikely to notice it unless you juxtapose two identical shots of an evenly lit surface taken at f/5.6 and, say, f/16. 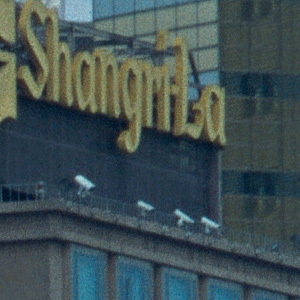 In other words, vignetting signature of the lens is gracefully unnoticeable. Indeed, the lens has a fairly large image circle—it can be shifted 10mm when used on the Hasselblad Flexbody camera (if necessary, you can actually push it up to 12mm). All test shots below were taken with Fujifilm Provia 100F slide film, scanned with a Hasselblad Flextight X5 scanner at 3200dpi and then sharpened in Photoshop with the use of PixelGenius PhotoKit Sharpener plug–in; the size of the original scans is approximately 6850 by 6850 pixels, and below are crops of the sharpened scans shown at 100%. Note that my comments are based not only on scrutinising the scans on the screen, but also on looking at fairly large (40cm by 40cm) prints. Of and by itself, the CFi 5.6/250 delivers very respectable performance with regard to sharpness. Furthermore, it is almost diffraction limited, i.e. its performance is already superb wide–open and does not improve noticeably as you stop the lens down. As can be seen in the examples below, the crop on the left is a teeny bit sharper than the one on the right (but this difference is not noticeable even in large prints). This (and a look at the MTF graphs) indicates that the lens performs optimally at around f/8. After that, diffraction starts to take its tall, which becomes visible in large prints at close examination somewhere past f/16. To put things into perspective, as can be seen below the CFi 5.6/250 delivers noticeably better sharpness than what one gets by using the CFi 4/150 lens with a 1.4X teleconverter (which is equivalent to 210mm, i.e. slightly shorter than 250mm); this, in fact, is visible in prints. 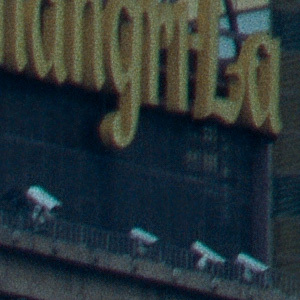 At the same time, the CFi 5.6/250 is quite usable with a 1.4X teleconverter, too, although here sharpness is not as good and chromatic aberration rears its ugly head. The reason I say "of and by itself" above, however, is that CFi 5.6/250 has a counterpart in the shape of the Sonnar Superachromat CFE 5.6/250 lens, which boasts an even better—some would say significantly better—performance in terms of sharpness (in fact, it is one of the sharpest optics in the V–series lens lineup). 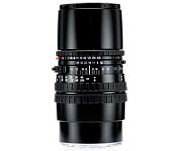 But of course, the improved performance of the Superachromat comes at a seriously steep price premium (if you can find the lens to begin with), which makes the CFi 5.6/250 a more than respectable "affordable" alternative. Although the Zeiss technical sheet indicates that the lens produces slight pincushion distortion, the aberration is barely perceptible even when dissecting slides with a ruler and a loupe on a light table. 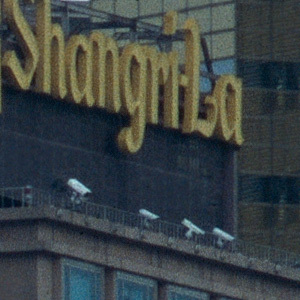 The lens is most certainly suitable for architectural applications, so feel free to run straight lines near and along the frame edges (note, however, that distortion becomes somewhat more pronounced when the lens is used with a teleconverter). I would describe this aspect of the optic's performance as follows: the lens readily produces hints of chromatic aberration. 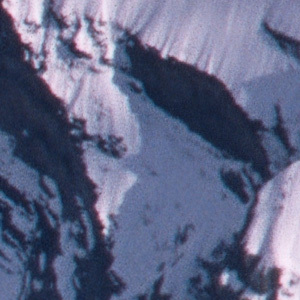 What I mean by this is that chromatic aberration can be seen very often and even around not very contrasty edges. At the same time, however, its degree is usually very mild, and the aberration would be seen in very large prints only. Below are a couple of fairly typical examples (keep in mind that the size of the original scans is approximately 6850 by 6850 pixels, and these are crops of the sharpened scans shown at 100%). Flare is very well controlled, which, of course, is not a major surprise given the fact that the lens has only four glass elements in three groups, as well as boasts the modern Carl Zeiss T* multicoating and improved internal baffling. 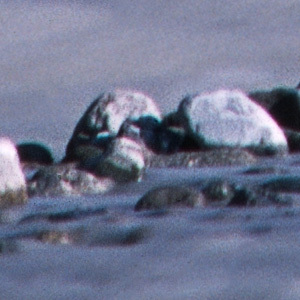 Nonetheless, some minor ghosting and contrast degradation can be seen when very bright sources of light are put within the frame. Using a lens hood whenever possible would certainly be prudent. The lens has five aperture blades that are not rounded, and I do not find out–of–focus areas particularly smooth looking, both wide open and stopped down. This being said, I have certainly seen far worse bokeh signatures, and the CFi 5.6/250 most likely will not disappoint too much in this regard if bokeh is not your primary concern. Reviewing Hasselblad V–series lenses is both boring and exciting. It is boring, because there is consistency in their performance: you sort of know what to expect and, as usual, there is not much to complain about; and it is exciting, because using a fine lens is always a treat. At the same time, it is never a waste of time: each lens has its unique characteristics and knowing them well allows obtaining the best image quality that each individual lens can deliver. If 250mm is a focal length that you favour, then I recommend the Sonnar CFi 5.6/250 without reservations.